It only took a few months of working full-time with computers for wrist fatigue to kick in. After a stretch of 10-12 hour days at the keyboard (at the time, it was the chiclet keyboard of a Macbook), my wrists would feel tight, and my fingers weak. I’d just quit my job working for the state to be a freelancer, and I began to panic that my body wouldn’t hold out! So I made a couple of drastic adjustments to the way I work. The one that’s had the most general benefit has been my standing desk, which allows me to keep my eyes straight forward, and my forearms parallel to the ground. Aside from this, there are two other big changes I’ve made to my setup. These are directly related to the keyboard itself. Dvorak – August Dvorak, inventor of the Dvorak keyboard layout, famously quipped that a text that would require 12-20 miles of finger travel on a QWERTY keyboard would take just one mile on Dvorak. This is probably an exaggeration.. Still, it’s hard to deny that Dvorak has a lot of intuitive appeal: vowels appear in the home row of the left hand, the most common consonants in the home row of the left hand, and typing English words generally requires fewer row jumps and other ugliness. Switching to Dvorak was hard – far harder, in my experience, than switching to a standing desk, or to Linux, or even to Vim. For a few weeks, I spent an hour or two per day doing drills in Master Key. Then I switched to using Dvorak in the morning, until my brain would hurt so bad that I’d switch to QWERTY by around 10am. When I could finally make it until noon using Dvorak, I quit QWERTY altogether, as code switching between the layouts was proving more difficult than Dvorak itself. During the transition, I was a slow typist (30-40 WPM for prose around the time of the final switch, down from 90-100 on QWERTY). This affected my work efficiency. Worse still, the stress of hesitating the slightest bit before each key press was actually making my wrist fatigue worse than it was with QWERTY. But I persisted. After about six weeks using Dvorak full-time, I was up to maybe 60-70 WPM. (I’m since up to at least my pre-Dvorak speeds.) And, most importantly, I finally started to reap the ergonomic benefits of Dvorak. I’m able to type with far less wrist movement than before, with the result that I have much, much more stamina – those 10-12 hour days tire my brain way before they tire my fingers. Totally worth it. 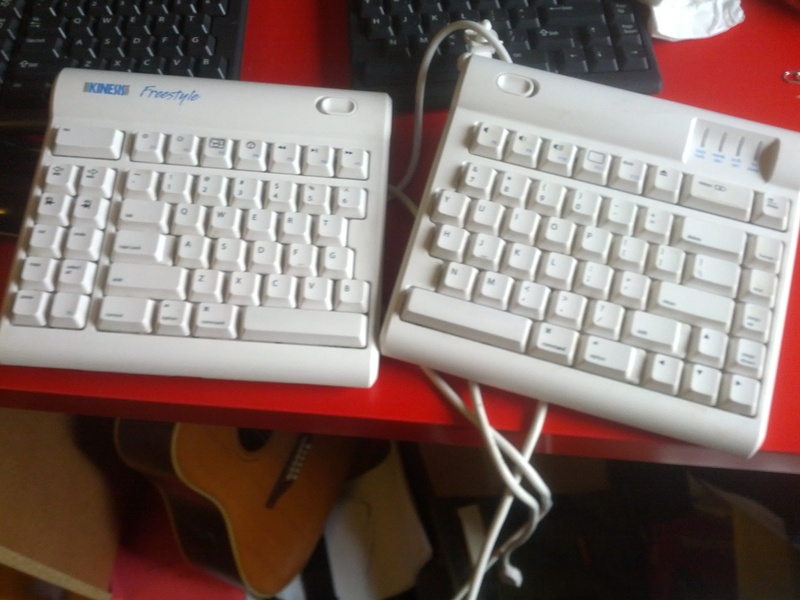 Kinesis Freestyle keyboard – I’d been typing for a long time on chiclet-style keyboards: first the Macbook, then the Macbook Pro, then an Apple USB keyboard. These keyboards are beautiful and quiet. But they don’t give much feedback. And touch-typing on them requires you to crook your wrists outward, in order to get your fingers resting on the home row. On the recommendation of my main man Marshall Sorenson, I bought myself a Kinesis Freestyle. It’s got nice, clicky keys. 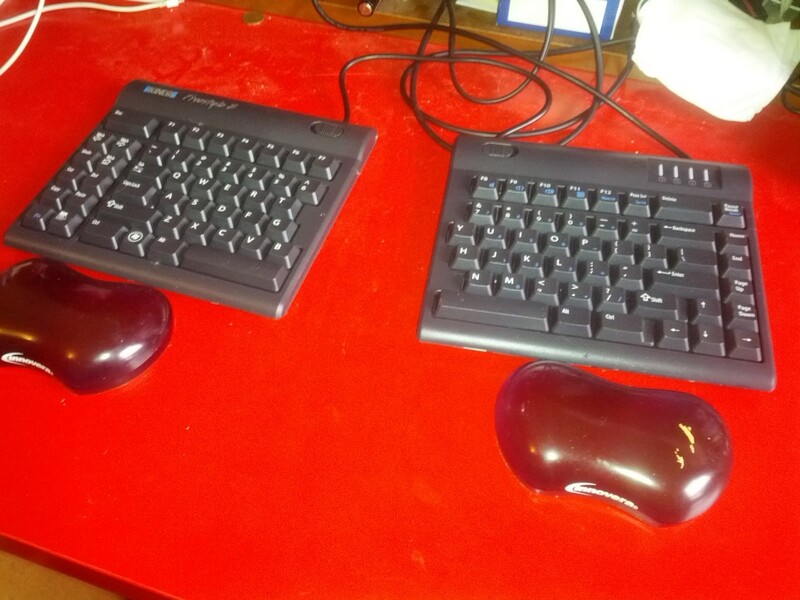 And it takes the idea of ergonomic keyboards to an extreme: the two halves of the keyboard are actually separate pieces, separated by an 8″ cable (a 20″ version is also available). Now I can keep the two halves positioned in such a way that I don’t have to bring my wrists too close together, and I don’t have to bend them at a funky angle to touch type. It takes a bit of work – and some risk – to make radical changes for the sake of ergonomics. But it’s an investment in the future. And don’t we all want to Win The Future? I won’t be needing my much-loved Freestyle for Mac anymore. Wanna buy it? It’s in perfect working order, and I’ll clean it up real nice before sending it out to you. These puppies are $100 new (and, actually, it looks like they’re discontinued at the moment, until the Freestyle 2 for Mac comes out). I’ll be happy to let it go to a faithful reader of this blog for $50, continental US shipping included. (If you’re outside the contintental US, contact me first to ask about shipping.) If I don’t get any bites, I’ll put it on eBay, but I’d rather see it go to a friend. Leave a comment or drop me an email: boone /at/ gorg dot es. Date: October 2, 2012 · Author: Boone Gorges. Lately it’s been fashionable to talk about the evils of sitting. This particular reporting trend hits especially close to home for me, as I’ve made the transition from peripatetic teacher/grad student to get-me-another-mountain-dew coder over the last year or two. 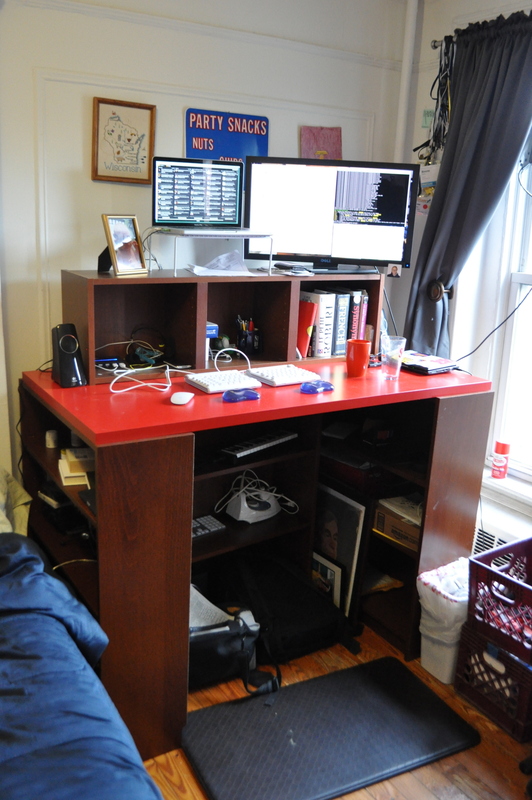 So, on the inspiration of a few blog posts (notably, Gina Trapani’s and Derek Brooks’s), I decided to give the standing desk a shot. I made the switch around five weeks ago. Here’s how I did it, and how it’s going. 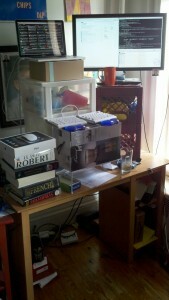 People who see my setup are often amazed by how high everything is, especially my screens. (Usually, these people are shorter than I am.) I am a big believer in being able to look at my computer screens without craning my neck downward, so I prop them all the way up to standing eye-level. 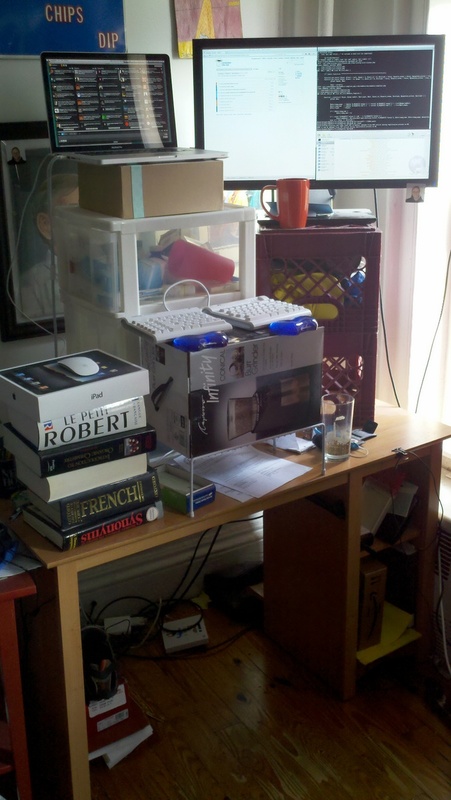 In fact, this is something I’ve always done, even at a regular sitting desk. For those using a laptop, this means getting a separate keyboard and mouse. But this one change – moving screens to a natural eye-level – has had more positive ergonomic effect than any other adjustment I’ve ever made in the way I work. I definitely recommend it. I did quite a bit of experimentation with keyboard/mouse heights. At first, I had put them too low – around waist level – which meant bending my wrists backward a lot. Then I overcompensated and moved them too high, but my hands kept getting cold and falling asleep due to decreased circulation. I settled on a height that allows me to keep my forearms roughly parallel to the floor at all times (which means that my elbows are at roughly a right angle, and my wrists are straight). To alleviate arm fatigue, I have a couple little gel-thingies where I rest the heels of my hands when I’m not typing quickly. The biggest complaint I’d seen about the switch to the standing desk had to do with foot fatigue, which many seem to experience during the switch. For some reason, I have never felt it. The only place I ever get sore is in my upper back, between my shoulder blades. This probably has something to do with the way that I tense up when I type or when I think too hard. (This happens a lot, because, duh, I’m such a deep thinker.) However, I did end up buying a standing mat, as I have hardwood floors that would get somewhat uncomfortable after an entire workday. I went with the Imprint Nantucket Series, which got nice reviews on Amazon. So far, I like it. To date, the experiment has had mostly positive results. Aside from the shoulder pain mentioned above, I don’t have any physical complaints. Standing seems to keep me more alert, and makes me feel less lethargic. It forces me to take breaks through the day (something I had a tendency not to do before, which probably had a net negative effect on my productivity). Generally I’ll take a half-hour sit around lunchtime, and if I’m lazy in the mid-afternoon, I’ll unplug my laptop and move to the couch for a while. Standing also means that I don’t work into the wee hours – I tend to start work around 8:30am and never work past 6 or 6:30pm. This is a good thing for my mental health. Finally, standing leads to much more dancing, which is, of course, something we all need more of in our lives. Date: June 8, 2011 · Author: Boone Gorges.